As one of the leading paint supplies stores in the San Francisco & Oakland, CA area, Cole Hardware provides custom paint matching services to help you find the perfect color for any project. We carry the Benjamin Moore paint lines Aura, Regal, Natura, ben, and more, along with a complete assortment of paint accessories: paintbrushes, rollers, wood refinishing products, spray paint, and much more. For help with paint matching, simply bring in a swatch of fabric or a quarter-size paint chip. We can match specific colors with just about any other brand on the market. Give us a call or stop in today to get started! Shop our vast selection of hardware including locks, security hardware, flooring materials, and weather stripping. Wide selection of power and hand tools. We stock repair parts, video and computer accessories, light fixtures, light bulbs, construction materials, and more. We have everything you need to get organized, including hangers, closet accessories, storage containers, and shelving. A vast selection of kitchen electrics, gadgets, cookware, bakeware, and bath needs, as well as seasonal fashion housewares, textiles, candles, and gifts. Our cleaning departments include supplies, polishes, and floor care products and emphasize environmentally friendly cleaning alternatives. All stores carry Miele vacuum cleaners, the premiere line of vacuums. Our nursery department is oasis for the urban gardener: plants, seeds, hoses, tools, soils, fertilizers, and decorative flower pots, with an emphasis on environmentally friendly and natural products. Enjoy the Bay Area’s mild Mediterranean climate with our broad assortment of outdoor furniture, including Fermob. Transform your patio or deck into a Parisian bistro with Fermob’s line of outdoor French furniture, which has not lost any of its authenticity. With its charm and wide array of colors—plum, poppy red, aubergine, verbena, honey, carrot, nutmeg, lagoon blue, and more—the bistro collection is available at our Rockridge, Cole Valley, North Beach, Russian Hill, and SoMa locations in chairs, 24-inch tables, and 30-inch tables. Wanting to upgrade to the ultimate outdoor barbecue experience? Look no further than Cole Hardware! Our stores carry EGGs in various sizes, along with a large assortment of “EGGcessories” that will take your grilling to new heights. We can assemble your EGG, too, deliver it right to your home, and put it in the exact spot you want it. Five stairs or five flights of stairs—no worries! We’ll even throw in a bottle of our signature Cutting Edge wine to enjoy with your first EGG-cooked gourmet meal. Don’t hesitate to call us or come in to see the EGG in person. One of our friendly “EGGspert” crew members will be happy to answer any questions. The classic barbecue brand for a reason, Weber makes fantastic gas and charcoal grills for every size space and every budget. Whether you are tailgating, working with a small patio, or have room to cook up a few rotisserie chickens, Weber has the grill for you. Come in and speak with one of our friendly grill experts to find your ideal Weber. In recent years, it has been reported that San Francisco family households with dogs now outnumber those with children! 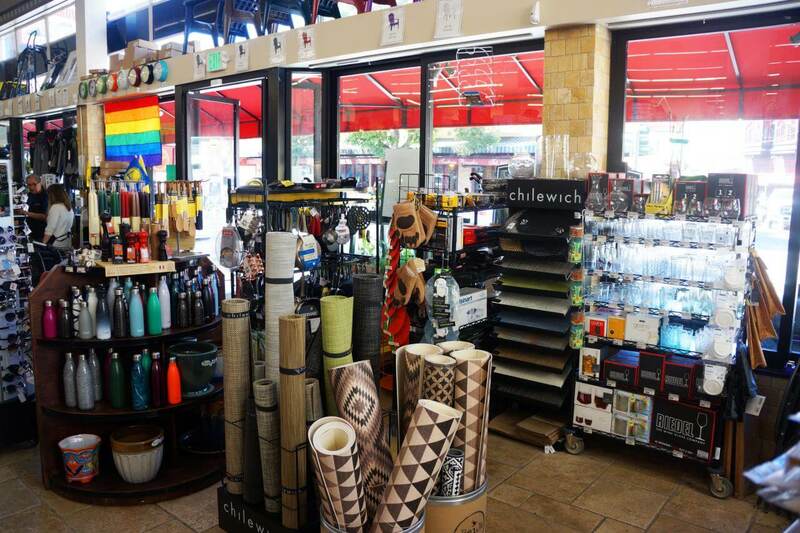 Whether you’ve got pets, kiddos, or both at home, Cole Hardware has something for everyone. With so many dog and cat lovers on our crew, we have fun curating our selection of toys, treats, food, and grooming supplies to ensure that your fur babies are happy and healthy. In fact, your well-behaved pets are welcome in the store to snag a treat at the registers too! We also stock basic supplies for birds and fish. Drinking plenty of water throughout the day has many well-established health benefits. With our impressive selection of water bottles from all the best brands, you can make a style statement while staying well hydrated. Whether your priority is insulation, portability, design, material (glass, BPA-free plastic, steel, etc. ), ruggedness, brand, or size, find your perfect bottle amid our wide selection of choices! We carry a variety of soft and hard coolers to fit any level of outdoor activity. From lunch coolers for the kiddos to Yeti bear-proof coolers for the ultimate outdoor adventurer, we’ve got you covered! Homes just keep getting smarter! Our stores now carry the popular Nest Learning Thermostat and Nest Cam security camera. Control all of your Nest products from a single app in any browser and on both Android and iOS devices. With live video streaming to a phone or computer, Nest Cam provides peace of mind and the ability to stay connected to the things you care about. No more missed deliveries or unnecessary key copies, Ring Video Doorbells allow you to communicate with visitors. With instant mobile alerts and two-way talk, you can answer your door from anywhere you have a smartphone, tablet, or PC! For your convenience, all Cole Hardware locations are equipped to help ensure you always make it home safely and never get caught without a stamp! Buy a new Clipper card, add cash value, or load passes onto your card with our cashiers. All cashiers have postage stamps ready for you to purchase, and our San Francisco stores also have Muni day passes and parking meter cards. You can head straight to our cash registers when you find yourself in need of any of these services. Better yet, add these items to your shopping list to take care of next time you’re in, so you never find yourself in a bind! Whatever the season, we have it: fans, heaters, barbecue supplies, holiday decor, and more. During Christmas, our stores are transformed into a one-stop shop for all your yuletide needs: freshly cut trees, live potted trees, poinsettias and other holiday plants, tree stands, wreaths, light strands, ornaments, gift wrap, and a whole lot more!